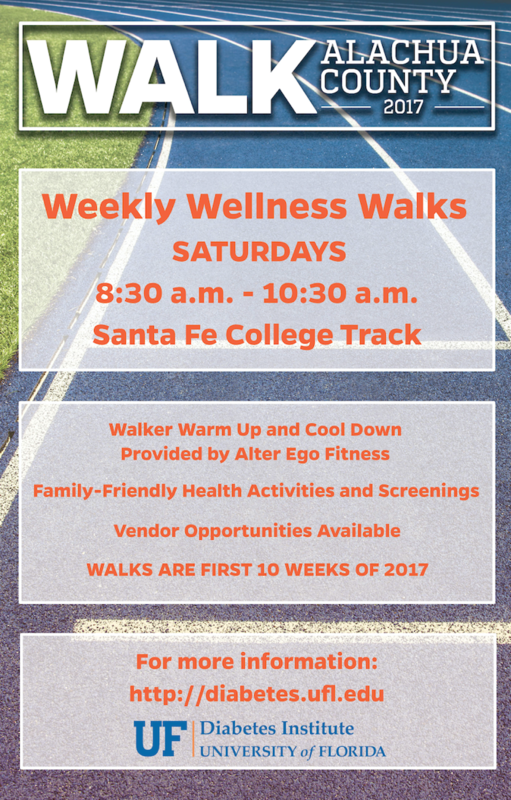 The University of Florida Diabetes Institute invites you to participate in Walk Alachua County, a 10-week wellness walk program beginning this Saturday, January 7, from 8:30 a.m. to 10:30 a.m., at the Santa Fe College track. The family-friendly walks will continue each Saturday through March 11. Walker warm up and cool down will be provided by Alter Ego Fitness, located in downtown Gainesville. Snacks and water will be provided to walkers. Local business and organizations are welcome to participate as vendors. Vendors must provide a free activity to benefit walk participants, bring their own table and supplies, and be approved in advance by the UF Diabetes Institute. For more information, visit the Walk Alachua County website. You may contact Gina Aulisio for more information at gaulisio@ufl.edu.